I Love You More Than Carrots: Maclane's Favorite New Toy! ... But since Maclane is only eight weeks old, I'll go ahead and include my two cents on the toy as well. As you can see, the Nuby Funshine toy was an absolute hit in our household. The minute Maclane took note of the flashing lights, he was smitten. What's more, when the toy was turned around and Maclane noticed himself in the mirror, he loved it even more. With bright colors, fun textures, lights and music, the Funshine toy is perfect for captivating and stimulating eight-week-old Maclane's rapidly growing little mind. He loves hearing the music play and has even begun to reach out and grab for it. One of my favorite aspects of the Funshine toy is that it hangs from a universal plastic toy clip that allows for it to be hung on a variety of baby toys, carriers and other products. Maclane loves to travel with his, so the Funshine toy has found a new home on the handlebar of our infant carrier car seat. I have a feeling I will need to quickly purchase another one to keep inside the house. Nuby describes their product as, "another innovative toy that combines exercise for young hands while providing visual and musical stimulation for your baby. By simply pressing the sun's textured nose, the character lights up and sings, "You Are My Sunshine." My only recommendation for this product would be for the music to play a little longer! Now, how often can you say that about a child's play toy? 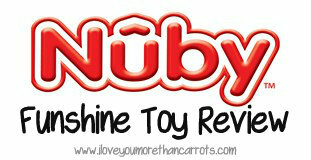 You can find the Nuby Funshine toy at the following retailers: Babies R Us, Kohls and Diapers.com. 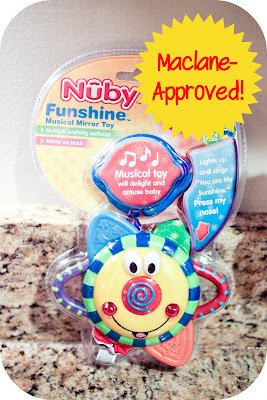 Disclaimer: Maclane and I did not receive monetary compensation for this post although we did receive the product to review as I am an official panel member of Nuby's Mom Bloggers. The above opinions are honest, unbiased and 100% my own. he should definitely get a commission for selling this!! so fun...had to smile right back!! Love the green polka dot apple appliqué... Perfect for school! I just found your blog and I love it. Congratulations on your newest little baby!